Obama urges two-state solution at the U.N.
NEW YORK (CNN) -- Former British Prime Minister Tony Blair said Wednesday that he believes within weeks Israel and the Palestinian Authority will begin talks aimed at a permanent resolution of their decades-long conflict. Blair: Mideast negotiations will restart in weeks. 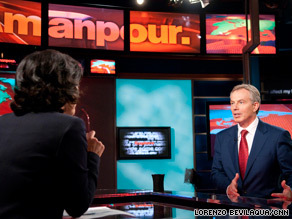 "I think that's what will happen, actually, over the next few weeks," Blair told CNN's Christiane Amanpour on Wednesday. "In the end, the issue really is this: What is the context within which this negotiation is being launched?" he said. "The worry for the Palestinians is that, if you don't lay down some conditions ... the negotiation won't be credible. What the Israelis say is, 'Look, we'll negotiate without precondition. We're not prepared until we start negotiating to yield this or yield that,'" he said on CNN's new show "Amanpour." "Now, personally, I think ... what will happen and should happen is that we try and put together the best possible context of the launch of the negotiation. It may not be everything that everyone wants, but get the thing under way." On Tuesday, U.S. President Barack Obama urged Israel and the Palestinian Authority to get moving on talks. "Simply put, it is past time to talk about starting negotiations. It is time to move forward," Obama told reporters before meeting with Israeli Prime Minister Benjamin Netanyahu and Palestinian Authority President Mahmoud Abbas. In his address to the U.N. General Assembly on Wednesday, Obama again made a strong call for renewed efforts to reach a Middle East agreement that creates a secure Israel and an independent Palestinian state. "The time has come to re-launch negotiations -- without preconditions -- that address the permanent-status issues: security for Israelis and Palestinians, borders, refugees and Jerusalem," he said. "The goal is clear: two states living side by side in peace and security -- a Jewish state of Israel, with true security for all Israelis; and a viable, independent Palestinian state with contiguous territory that ends the occupation that began in 1967, and realizes the potential of the Palestinian people." Israeli Deputy Prime Minister Dan Meridor and chief Palestinian negotiator Saeb Erekat insisted separately Wednesday that each wanted to begin negotiations, but continued to disagree over issues that have prevented the talks from starting. "The most important thing is to start negotiations," Meridor told Amanpour. "Let me tell Mr. Erekat, my friend, that we are ready to negotiate everything," Meridor said. "We need to have a strategy of what to do first and second, but everything is on the table. All the issues can be laid on the table. We need to negotiate, because we need to move ahead." Erekat said his side also wanted to begin talks, but said he wanted to be sure that the Jewish state halts all settlement building in the occupied West Bank and in predominantly Palestinian East Jerusalem. He also wants negotiations to pick up where they left off with former Prime Minister Ehud Olmert. "We are not against negotiations," he said. "We are not against our commitment to our obligations. They are refusing to carry out their obligations in terms of settlement freeze, and they refuse to resume negotiations on Jerusalem, borders, settlements, where we left off," he said.